By Stefanie Wilder Taylor, contributor to the Seleni Institute, a nonprofit mental health and wellness center for women and mothers in New York City. A lot of moms love to drink, and I get it. I used to be one of them. Parenting can be a cocktail of sleep deprivation, anxiety, and stress and sometimes it seems the only way to cope is to, well, have a cocktail. New babies swing into our lives like tiny wrecking balls, destroying adult life as we know it, and many of us have trouble climbing from the rubble. I don't care if you're the Dalai Lama, having a baby is going to stress you out. In fact, the Dalai Lama is a celibate Buddhist monk. He has no kids. No wonder he's so serene. But when you're raising tiny human beings, drinking can easily become the default way to unwind. Alcohol is a reliable stress reliever that's readily available and socially acceptable. It also makes us feel connected to other moms, even if we're not there to bond in person. There's a reason all those drinking mom memes make the rounds on Facebook: "You're not really drinking alone if your kids are home!" or "The most expensive part of having kids is all the wine you have to drink!" 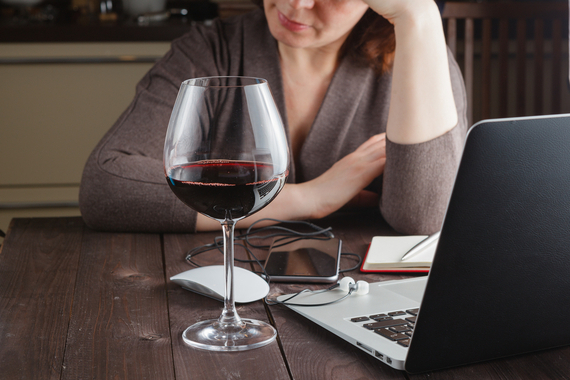 The Facebook group Moms Who Need Wine has more than 770,000 members. Obviously if you like your wine, you have plenty of company. But what if you start liking your wine a little too much? How do you know? That's the question I get asked more than any other in the almost seven years since I quit drinking and went public with my decision. And sadly, I can't answer it for you. I had a difficult time answering it for myself. I loved to drink. I wrote a whole book - Sippy Cups Are Not For Chardonnay - about the virtues of easing parenting boredom and stress with a little booze. Every once in a while I questioned my drinking, but I always managed to convince myself it was under control. After all, alcoholics were nothing like me, I told myself. Alcoholics were like my junior high science teacher with shaky hands who sipped vodka and OJ out of a coffee mug, thinking no one knew. Alcoholics drank booze alone. Out of a paper bag. I didn't do any of that. I didn't have a problem. Which was a good thing because when I became a mom, I really needed to drink. And that's when my drinking went from something I did for fun to a way to self-medicate. When my first daughter was born, I developed postpartum anxiety (although I didn't know it at the time). I was consumed with the enormity of keeping this little baby alive. I thought it was normal to lay on the bed with your newborn counting their breaths because WedMD said they should be taking 30-60 a minute. When I finally gave up on breastfeeding after three miserable weeks, I was positive I was lowering her IQ every time I gave her a bottle. To deal with these feelings, I upped my wine. I felt I deserved it, and I desperately needed a way to unwind. Then I got pregnant with twins and easily went through my whole problematic pregnancy without one sip of wine - proving to myself I didn't have a problem. But when the twins came early, and I suddenly had three kids - two of whom were colicky - I practically sprinted back to booze. Alcohol is tricky. It's a seriously addictive substance that makes you feel good (initially) and is available everywhere. And for some this is no problem. There are women who can up their drinking for a while with no major ill effects. I call these people the Take It or Leave Its. You've probably seen them at parties ignoring the cookies and brie. These moms are able to find relief in a glass of wine and stop there. Still others may go further, start worrying their drinking isn't normal and dial it back or moderate through counseling, or just a change in lifestyle. But then there are those of us who find ourselves dependent on drinking. When I turned the wine spigot back on after my twins were born, somehow, try as I might, I couldn't quite manage to turn it back off. Pretty quickly I was back to daily drinking and, although it concerned me, I didn't want to stop completely. So I bargained: I will only drink on weekdays. But by Friday night, I would see the folly of my plan. It makes a lot more sense to only drink on weekends. But then Monday would roll around and I'd give in to "just one glass." Eventually I stopped trying to not drink every day, and I just attempted to keep it to a glass or two. I mostly failed. But each time I managed to stick to two, I called it a victory. Yes! This proves I don't have a problem. I don't have to stop forever! But, one evening I had three martinis with a bunch of moms, thought I felt fine and drove home. When I woke up in the morning, hungover, I knew I hadn't been okay to drive. This was indelible proof to myself that I couldn't be trusted to drink any amount of alcohol. I was petrified. Simply promising myself I wouldn't drink anymore wouldn't work. I knew myself better than that. So I called a friend who had been sober for a couple of years and asked her for help. That's how I ended up at a 12-step meeting. At first I felt humiliated. I couldn't believe it had come to this. Sharing my story of drinking and driving with my children in the car felt like leaping off a cliff. I was so scared I would be judged. What kind of a mother drinks too much and puts her children in harm's way? But then other women came up to me and said they'd done something similar, and I discovered something powerful that night: a room full of "Me Too." There is such great relief in relating. But it wasn't magic. At first I didn't know how I would function without the help of a little wine. What will I do in the evening? Am I just supposed to sit on the couch and watch The Bachelor stone-cold sober, jaw clenched, unable to relax and leave my day behind? And yeah, there were a few of those nights. One night I called a support group friend and told her I was positive I needed just one teeny glass of wine. Or at the very least a Xanax. She gently reminded me that it's normal to want it but the longer I went without it, the easier it would get. She was right. I have found other ways to relax - like drinking a cup of tea or watching bad television or just venting about my stresses instead of drinking over them. I didn't think I could feel this even, this content without drinking, but I do. It took some getting used to, but I don't miss or need the alcohol to feel good, social, or patient. If I pay attention to what's going on inside of me instead of just reaching for the wine, I feel better. Looking back, I'm grateful I had a tangible incident that let me give up the fight. I know it's tough if you find yourself in a gray area where your drinking doesn't resemble the alcoholics you see in movies and yet it still feels wrong to you. Most of us, especially those of us with a real problem, will find any way to rationalize our drinking because it seems very scary to give it up completely - and even scarier to admit that you might need help doing so. But if you are struggling to cut down or give it up, there is no shame in that. Because you know what? Me too. There are tons of moms out there who have been where you are and would love to help. Come find us in meetings or on recovery blogs and podcasts. I started a Yahoo Group called the Booze Free Brigade, which is a great place to start. Join us. We are out here raising a virtual glass of LaCroix sparking water to you, mama. This article was originally published on the Seleni Institute website and is reprinted here with permission. Seleni is a nonprofit mental health and wellness center providing clinical services, provider training, research funding and online information and support for women and mothers. You can follow Stefanie on Twitter @SWilderTaylor and Seleni @selenidotorg.